The Inspire Series of Electronic Hands free Paper Towel Dispenser - TD-0235 is a compact and simple design offering a reliable and efficient hands-free operation. The sophisticated sensor automatically dispenses when hand is placed under sensor. 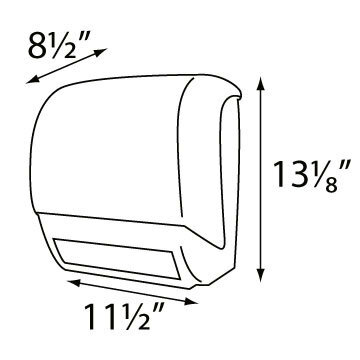 The paper towel dispenser includes a stub roll tray to deliver a more precise control of consumption. The Inspire series is economically design and offers a lower waste with a reliable dispense of 11" sheet with every cycle. A/C Converter (optional above) Add the A/C converter that plugs into and standard 110-120 volt outlet.